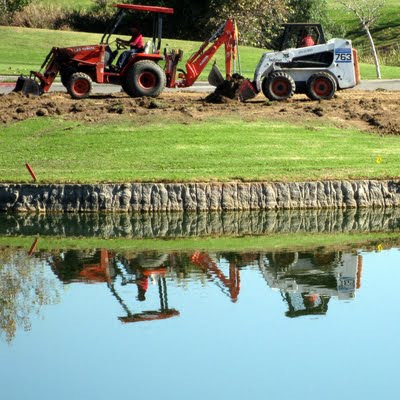 Men and their machines, reflected in a golf course pond. This also reflects our Southern California drought. Please visit James, at http://newtowndailyphoto.blogspot.com/, to see who else posted a reflection or two. You've turned a mundane subject into a very nice photo. Big boys toys and all. Congrats, and Happy weekend Reflections! Great photo! And a beautiful reflection, the water is so calm. Don't usually see machinery like this in a reflection...nice shot. yes, the drought is apparent in the colour of the grass and the dryness of the soil. Oh but what a wonderful reflection in have captured. And so complete. I do like the way the edge of the pond defines the real from the reflect. Good capture. The reflection softens the sharp lines of the machines and makes them appear quite romantic and artistic! Excellent, I love this! Well done! Hi Jan, nice to meet you at Weekend Reflections. I am from the LA area and I understand about our drought. But this is just a wonderful image and reflection. The texture of the rocks on the water's edge is beautiful! Excellant catch Jan. Perfect choice. Hope these men will have some time off this weekend! "Hi Ho Hi Ho it's off to work they go!"